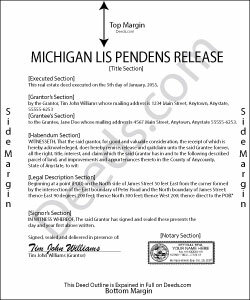 When the case is settled or abandoned it is prudent to release the lis pendens document. A property could be passed over by a buyer because of the existing notice. Damages could then be realized by the seller. 600.2725 Notice lis pendens; cancellation; costs. (1) If a plaintiff filing the notice before the service of the summons fails to serve the same within the time prescribed in this chapter, or after the action is settled, discontinued or abated, or final judgment is rendered therein against the party filing the notice, and the time to appeal therefrom has expired, the court, upon the application of any person aggrieved and upon such notice as may be directed or approved by it, shall direct that a notice of the pendency of an action be canceled of record by a particular register of deeds, or by all the registers of deeds, with whom it is filed. (2) If a plaintiff filing the notice unreasonably neglects to proceed in the action, or does not commence or prosecute the action in good faith, the court, in its discretion, upon the application of any person aggrieved and upon such notice as may be directed or approved by it, may direct that a notice of the pendency of an action be canceled of record by a particular register of deeds, or by all the registers of deeds, with whom it is filed. (3) The cancellation shall be made by a note to that effect, on the margin of the record, referring to the order. A certified copy of the order shall be filed for record with the register of deeds before the notice is canceled. (4) The court, in its discretion, upon directing cancellation of the notice upon termination of the action, or during the pendency thereof if satisfied that the plaintiff who filed the notice unreasonably neglected to proceed in the action or did not commence or prosecute the same in good faith, may direct the plaintiff to pay all or any of the costs and expenses occasioned by filing the notice and the cancellation of the record, aside from the costs of the action itself. Pat K. said: It has been very easy. Like that the recording is so fast. Jane N. said: This worked. Saved me a trip to get a copy of a deed. Cost less than the parking fee. Very convenient. Shirley R J. said: Great website.....fast and easy access!